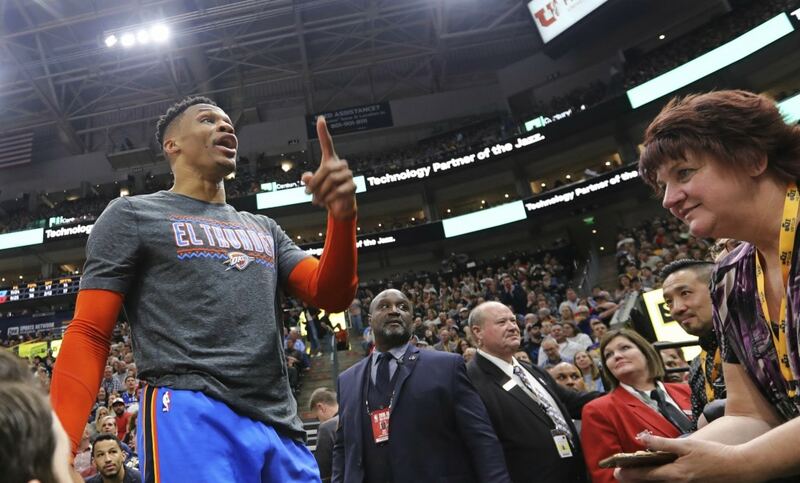 Oklahoma City Thunder star Russell Westbrook got into a heated verbal altercation with a Utah Jazz fan on Monday, resulting in Westbrook using profanity against the fan and his wife. But the 6’3″ point guard says the fan is the one who started it by using a racial taunt. During postgame interviews , Westbrook spoke to reporters, and gave his side of the story. “How it started was, a young man and his wife in the stands told me to ‘Get down on my knees like I used to.’ And for me, that’s just completely disrespectful to me. I think it’s racial, I think it’s inappropriate in the sense that there is no protection for the players,’ Westbook said. “There are a lot of great fans around the world that like to come to the game to enjoy the game. Then there are people that to come to the game to say mean and disrespectful things about me and my family,” he said. “For many years I’ve done all the right things, I’ve never done anything to hurt or harm anybody. I never been in any trouble. Never fought a fan. Been in the league 11 years, clean slate. Humble. I take whatever, all the criticism from everybody [and] I been doing the same thing for years,” the player and father of three stated. Westbrook went on to allege that this wasn’t his first racially-motivated incident in Utah, something that retired Lakers player, Matt Barnes, later tweeted and agreed with. “Disrespect will not be taken from me. Since I’ve been here, especially in Utah, a lot of disrespectful things have been said,” Westbrook said. The fan in question has denied saying any racist comments to Westbrook, claiming instead that he yelled, “iced those knees up,” according to KSL5-TV . In his post-game interview, Westbrook addressed the comments directed at Keisel’s spouse. “As for beating up his wife, I have never put my hand on a woman; I never will. Never been in any domestic violence before. Never have before, but once he said the comment, his wife repeated the same thing to me as well. So that’s kind of how that started,” Westbrook explained. Despite Keisel denying that he and his hurled racially-charged insults at Westbrook, the MVP sticks by his story, and his message.